Mr. Hames Class | What did you learn today? Okay, so you ask what is the difference between the two. Easy! One is focused on pure numbers and the other is laser centered on personal one to one partnership. One never should think of building a network of friends for the sole purpose of simply having lots of friends. Nowadays we judge people on Linkedin contacts or number of Facebook friends. When will we learn that networking is so much more than passing out our business cards or resumes to hundreds of people or having over 500+ Linkedin connections? Let’s make this easy. Cultivating relationships or building a network will take two simple changes in your mindset. Yes you will share contact information but the difference now is how you follow-up with the person. You will call or set up a meeting with the person within a very short time period. You will not wait weeks or months but a day or two or even that very day to connect with the other person in person or at least in a phone conversation. Second, you will offer that person value at the meeting in return for meeting with you even if it is just a cup of coffee. Returning the favor for them sharing their experience or insight is the least you can do for them. Solid relationships are built on the premise it is a two way street and not just what can I get out of this relationship. Much like a marriage it is thinking of the other person first that will gain you the most from the partnership. Try contacting just one person a day for a week and see if they want to connect with you and then meet with them and invest your life in them. Ask them how you can serve them. You will be amazed at how you will grow your “network of friends” and maybe even cultivate a great relationship in return. I just heard several great people I admire talk about the importance of the written and spoken work. I am reminded that I have a deep responsibility to use my pen and tongue to build and encourage others. I am also reminded that I can speak truth into others and give a blessing or curse with my words. I purpose to be even more responsible for every idle word that tries to sneak out of my mouth or on paper. How about you? Question: Do you feel you create your circumstances or do your circumstances create you? Why do you feel this way and explain the difference between both thought patterns? Tamecka Crawford made a significant change in her life by altering the way she saw life. What do you think triggered this change and why do you suppose other people never come to this point in life? This book will dramatically improve the level of success of any teenager on their road to adulthood. 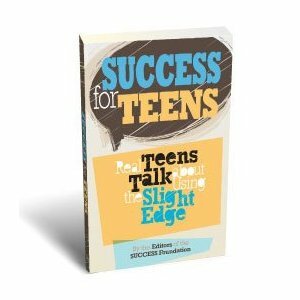 Success for Teens will show Teenagers that success is not about smarts, looks, or luck. It’s about becoming the best possible person they can be and making the most of their talents and opportunities. By understanding and applying the slight edge philosophy, they’ll learn the time-tested principles for excelling in all areas of their life: Time Management, Goal-Setting, Self-esteem, dream-building, self-motivation, habits and purpose. In this book study we will take one chapter a week and discuss the contents of the book as well as blog about what you are learning. I hope you can really learn from some of the truths that it has to offer. Tell me what your first impression are about reading this book? Have you ever read a book like it before? Jesselin Rodriguez is not unlike many students. How would you have handled the problems she faced? Write one question that you would like the author to answer about Chapter 1. Finally, be sure to answer all question on pages 16, 17 and 18 using the space provided in your book. This will not be taken up each week but will be periodically checked to see that you are journaling your thoughts and answers to the questions. NOTE: All questions must be answered by 12 midnight on Sunday night. No exceptions. Also feel free to make comments on what others have written. Remember, if you do not have the Internet at home, you must answer this question on a sheet of paper and turn in first thing Monday morning or earlier.